Austria is one of the 14 richest countries in the world in terms of GDP (Gross domestic product) per capita, has a well-developed social market economy, and a high standard of living. Until the 1980s, many of Austria's largest industry firms were nationalised; in recent years, however, privatisation has reduced state holdings to a level comparable to other European economies. Labour movements are particularly strong in Austria and have large influence on labour politics. Next to a highly developed industry, international tourism is the most important part of the national economy. Germany has historically been the main trading partner of Austria, making it vulnerable to rapid changes in the German economy. However, since Austria became a member state of the European Union it has gained closer ties to other European Union economies, reducing its economic dependence on Germany. In addition, membership in the EU has drawn an influx of foreign investors attracted by Austria's access to the single European market and proximity to the aspiring economies of the European Union. Growth in GDP accelerated in recent years and reached 3.3% in 2006. In 2004 Austria was the fourth richest country within the European Union, having a GDP (PPP) per capita of approximately €27,666, with Luxembourg, Ireland, and Netherlands leading the list. Vienna was ranked the fifth richest NUTS-2 region within Europe (see Economy of Europe) with GDP reaching €38,632 per capita, just behind Inner London, Luxembourg, Brussels-Capital Region and Hamburg. Growth has been steady between 2002–2006 varying between 1 and 3.3%. After hitting 0% in 2013, growth has picked up a little and as of 2016 sits at 1.5%. Ever since the end of the World War II, Austria has achieved sustained economic growth. In the soaring 1950s, the rebuilding efforts for Austria lead to an average annual growth rate of more than 5% in real terms and averaged about four point five percent through most of the 1960s. Following moderate real GDP growth of 1.7%, 2% and 1.2%, respectively, in 1995, 1996, and 1997, the economy rebounded and with real GDP expansion of 2.9 percent in 1998 and 2.2% in 1999. Austria became a member of the EU on 1 January 1995. Membership brought economic benefits and challenges and has drawn an influx of foreign investors attracted by Austria's access to the single European market. Austria also has made progress in generally increasing its international competitiveness. As a member of the economic and monetary union of the European Union (EMU), Austria's economy is closely integrated with other EU member countries, especially with Germany. On 1 January 1999, Austria introduced the new Euro currency for accounting purposes. 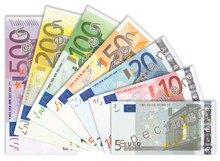 In January 2002, Euro notes and coins were introduced, replacing those of the Austrian schilling. In 1999, Austria introduced the single European currency, the euro. With 18 other EU member states it forms the Eurozone. In Austria, Euros appear as 1999, however all Austrian euro coins introduced in 2002 have this year on it; unlike other countries of the Eurozone where mint year is minted in the coin. Eight different designs, one per face value, were selected for the Austrian coins. In 2007, in order to adopt the new common map like the rest of the Eurozone countries, Austria changed the common side of its coins. Before adopting the Euro in 2002 Austria had maintained use of the Austrian schilling which was first established in December 1924. The Schilling was abolished in the wake of the Anschluss in 1938 and has been reintroduced after the end of the World War II in November 1945. Austria has one of the richest collection of collectors' coins in the Eurozone, with face value ranging from 10 to 100 euro (although a 100,000 euro coin was exceptionally minted in 2004). These coins are a legacy of an old national practice of minting of silver and gold coins. Unlike normal issues, these coins are not legal tender in all the eurozone. For instance, a €5 Austrian commemorative coin cannot be used in any other country. Many of the country's largest firms were nationalised in the early post-war period to protect them from Soviet takeover as war reparations. For many years, the government and its state-owned industries conglomerate played a very important role in the Austrian economy. However, starting in the early 1990s, the group was broken apart, state-owned firms started to operate largely as private businesses, and a great number of these firms were wholly or partially privatised. Although the government's privatisation work in past years has been very successful, it still operates some firms, state monopolies, utilities, and services. The new government has presented an ambitious privatisation programme, which, if implemented, will considerably reduce government participation in the economy. Austria enjoys well-developed industry, banking, transportation, services, and commercial facilities. Austria has a strong labour movement. The Austrian Trade Union Federation (ÖGB) comprises constituent unions with a total membership of about 1.5 million—more than half the country's wage and salary earners. Since 1945, the ÖGB has pursued a moderate, consensus-oriented wage policy, cooperating with industry, agriculture, and the government on a broad range of social and economic issues in what is known as Austria's "social partnership". The ÖGB has often opposed the Schüssel government's programme for budget consolidation, social reform, and improving the business climate, and indications are rising that Austria's peaceful social climate could become more confrontational. Austrian farms, like those of other west European mountainous countries, are small and fragmented, and production is relatively expensive. Since Austria's becoming a member of the EU in 1995, the Austrian agricultural sector has been undergoing substantial reform under the EU's Common Agricultural Policy (CAP). Although Austrian farmers provide about 80% of domestic food requirements, the agricultural contribution to gross domestic product (GDP) has declined since 1950 to less than 3%. Although some industries are global competitors, such as several iron and steel works, chemical plants and oil corporations that are large industrial enterprises employing thousands of people, most industrial and commercial enterprises in Austria are relatively small on an international scale. Most important for Austria is the service sector generating the vast majority of Austria's GDP. Vienna has grown into a finance and consulting metropole and has established itself as the door to the East within the last decades. Viennese law firms and banks are among the leading corporations in business with the new EU member states. Tourism is very important for Austria's economy, accounting for around 10 percent of Austria's GDP. In 2001, Austria was the tenth most visited country in the world with over 18.2 million tourists. Previously, dependency on German guests made this sector of the Austrian economy very dependent on German economy. 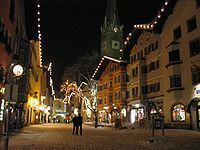 However recent developments have brought a change, especially since winter ski resorts such as Arlberg or Kitzbühel are now more and more frequented by Eastern Europeans, Russians and Americans. 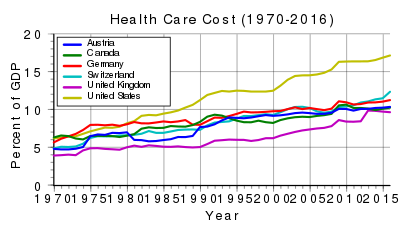 Austria’s health care system was developed alongside other social welfare programmes by the social democrats in Vienna initially. Trade with other EU countries accounts for almost 66% of Austrian imports and exports. Expanding trade and investment in the emerging markets of central and eastern Europe is a major element of Austrian economic activity. Trade with these countries accounts for almost 14% of Austrian imports and exports, and Austrian firms have sizable investments in and continue to move labour-intensive, low-tech production to these countries. Although the big investment boom has waned, Austria still has the potential to attract EU firms seeking convenient access to these developing markets. Companies and investors from Austria are active in mergers and acquisitions (M&A). Since 1991, more than 7,183 mergers & acquisitions transactions have been announced with a known total value of 261.6 bil. EUR. In 2017, over 245 deals with a total value of over 12.9 bil. EUR have taken place. They are not only active in national deals, but also as important investors in cross-border M&A abroad, with Germany being the most important partner. 854 German companies have been acquired by Austrian parant companies (outbound) so far. The industry with the largest M&A activity in Austria in terms of transaction value has been the financial sector, whereas the industry with the largest number of transactions has been Industrials - representing 19.2%. The following table shows the main economic indicators in 1980–2018. Inflation under 2% is in green. ^ a b c d e f g h "World Economic Outlook Database, October 2018". IMF.org. International Monetary Fund. Retrieved 25 March 2019. ^ a b c d e f g h i j k l m n o p q "The World Factbook". CIA.gov. Central Intelligence Agency. Retrieved 25 March 2019. ^ "Gini coefficient of equivalised disposable income - EU-SILC survey". ec.europa.eu. Eurostat. Retrieved 25 March 2019. ^ "Ease of Doing Business in Austria". Doingbusiness.org. Retrieved 21 November 2017. ^ "Scope affirms Austria's long-term credit rating at AAA with Stable Outlook". Scope Ratings. Retrieved 8 March 2019. ^ "Austria". International Monetary Fund. Retrieved 22 April 2009. ^ Austrian Economic Chamber (July 2018). "GDP Growth in Austria" (PDF). Retrieved 14 August 2018. ^ "Austria in the EU". Austrian Embassy Washington. Retrieved 8 October 2018. ^ "Trade and Industry in Austria, Exports, Tourism". www.austria.info. 2007. Archived from the original on 27 November 2007. Retrieved 20 December 2007. ^ "M&A Statistics by Countries - Institute for Mergers, Acquisitions and Alliances (IMAA)". Institute for Mergers, Acquisitions and Alliances (IMAA). Retrieved 1 March 2018. ^ "Mergers & Acquisitions in Austria". Institute for Mergers, Acquisitions and Alliances (IMAA). Retrieved 1 March 2018. ^ "Report for Selected Countries and Subjects". Retrieved 1 September 2018. ^ "Report for Selected Countries and Subjects". www.imf.org. Retrieved 12 April 2019. The Estonian economy is an advanced economy and a member of the European Union and of the eurozone. The Estonian economy is heavily influenced by developments in the Finnish and Swedish economies. 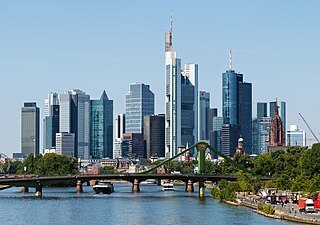 The economy of Germany is a highly developed social market economy. It has the largest national economy in Europe, the fourth-largest by nominal GDP in the world, and fifth by GDP (PPP). In 2017, the country accounted for 28% of the euro area economy according to the IMF. 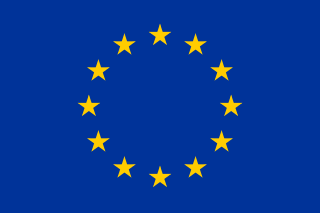 Germany is a founding member of the European Union and the Eurozone. The economy of Latvia is an open economy in Northern Europe and is part of the European Union's (EU) single market. Latvia is a member of the World Trade Organization (WTO) since 1999, a member of the European Union since 2004, a member of the Eurozone since 2014 and a member of the OECD since 2016. Latvia is ranked the 14th in the world by the Ease of Doing Business Index prepared by the World Bank Group, According to the Human Development Report 2011, Latvia belongs to the group of very high human development countries. Due to its geographical location, transit services are highly developed, along with timber and wood-processing, agriculture and food products, and manufacturing of machinery and electronic devices. The euro came into existence on 1 January 1999, although it had been a goal of the European Union (EU) and its predecessors since the 1960s. 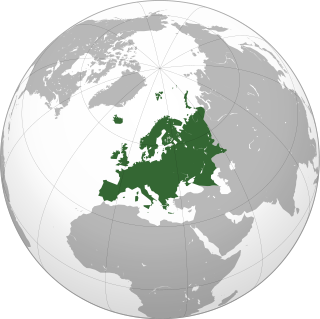 After tough negotiations, particularly due to opposition from the United Kingdom, the Maastricht Treaty entered into force in 1993 with the goal of creating an economic and monetary union by 1999 for all EU states except the UK and Denmark. 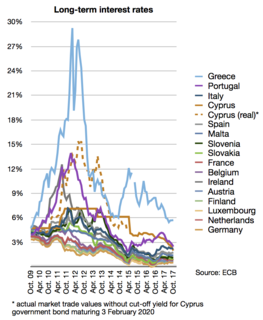 The European debt crisis is a multi-year debt crisis that has been taking place in the European Union since the end of 2009. Several eurozone member states were unable to repay or refinance their government debt or to bail out over-indebted banks under their national supervision without the assistance of third parties like other eurozone countries, the European Central Bank (ECB), or the International Monetary Fund (IMF). The Greek government-debt crisis is the sovereign debt crisis faced by Greece in the aftermath of the financial crisis of 2007–08. Widely known in the country as The Crisis, it reached the populace as a series of sudden reforms and austerity measures that led to impoverishment and loss of income and property, as well as a small-scale humanitarian crisis. In all, the Greek economy suffered the longest recession of any advanced capitalist economy to date, overtaking the US Great Depression. As a result, the Greek political system has been upended, social exclusion increased, and hundreds of thousands of well-educated Greeks have left the country. This is a list of acronyms and initialisms associated with the eurozone crisis.